This grand painting is in the permanent, never to be borrowed, home of The Wallace Collection in Manchester Square, London. 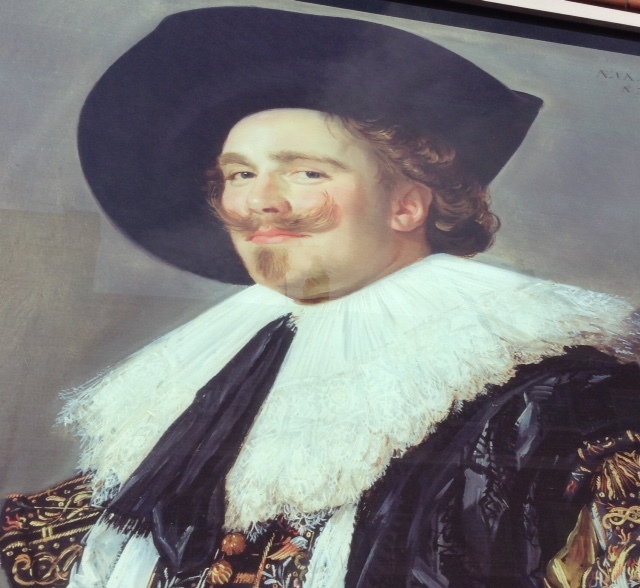 It is called The Laughing Cavalier, painted by Baroque Dutch genius of the Golden Age, Frans Hals in 1624. A man who was exempt at catching the fleeting moment of his sitter, his character, his individual beauty and his unique expression. The luscious clothes, collar and hat, whatever attribute suitable, would define and distinguish each fine noblemen. The term ‘Laughing‘ was only given when the painting was catalogued for the first display exhibition at The Bethnal Green Museum, 1872-75 and has stuck ever since. If he laughed he may disturb the fantastic wispy moustache so stylistically brushed, drawing attention to those lovely pink lips. It is a polished, preserved and perfected portrait. This large reproduction is on the exterior of Hertford House/ The Wallace Collection and greets me as I walk north to the district of Marylebone. It is a reminder that a little smile lightens your face, catches attention and transforms your outlook…he will always make me smile. It is also a good reason to slow down, pace yourself, to think quietly, then brighten your day and raise all prospects with a smile. A shapely smile is a free creation of your own: a poetical pout!